Energy Efficient Ecodesign Ready Stoves. 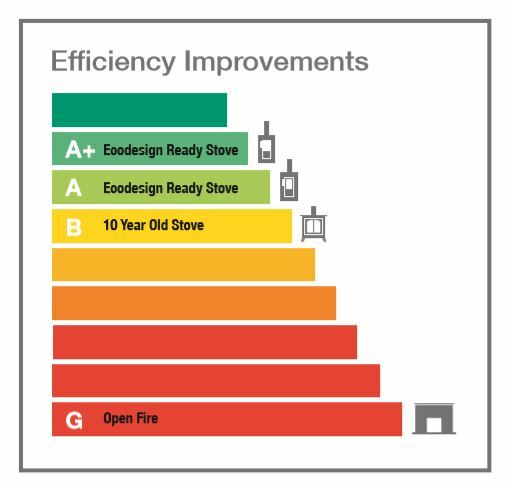 Great strides forward in stove design have resulted in modern stoves having an efficiency of over 80%, compared to an open fire at 30% and a stove produced ten years ago, with an average efficiency of 65%. The energy efficient improvement under Ecodesign for wood burning stoves is 4%. The growth in efficiency over the last ten years can be clearly seen in the efficiency chart shown below. The Efficiency of the appliance also plays an important role in the amount of wood required, as shown in the diagram below. Significantly fewer logs are required in an Ecodesign Ready stove. Saving money and reducing emissions.